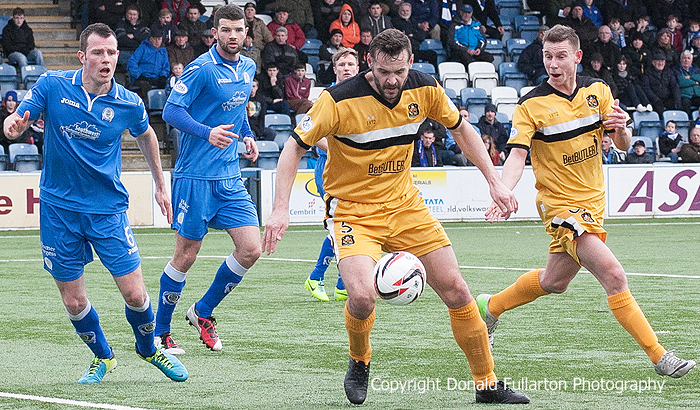 DUMBARTON, unbeaten throughout January and February, finally tasted defeat on the first day of March at Palmerston Park, Dumfries. DUMBARTON, unbeaten throughout January and February, finally tasted defeat on the first day of March in front of a 1,604-strong crowd at well kept Palmerston Park, Dumfries. Queen of the South leapfrogged their visitors into fourth place in the SPFL Championship with a 3-1 victory in what was a very competitive match. In the first half Sons seemed to have their minds on next Saturday's William Hill Scottish Cup quarter-final at Aberdeen, and rarely threatened. However Chris Kane had a good header which was well saved and big defender Mark McLaughlin blasted over from close range. Mark Durnan headed home from a free kick to open the scoring after 30 minutes, and just before the interval Gavin Reilly netted no.2 from close range. The game was much more competitive in a second half which produced a goal for each side. Yet with a little more luck in front of goal Sons — and in particular striker Kane — could have scored several times. In 65 minutes Robert McHugh made it three for the Doonhamers with a fine shot past comeback keeper Jamie Ewings, but six minutes later on loan Celtic defender Michael Miller pulled one back for Sons with a long range effort which was deflected into the net. Chances came and went for the visitors after that, and it was a relieved home side who heard the final whistle after prolonged spells of Dumbarton attacks. The picture shows Mark McLaughlin lining up a shot.